ARE THERE ANY LENSES THAT WILL HELP FOR DRIVING? Rodenstock's SunContrast Drive lens, filters blue scattered light, giving a high contrast visual impression. This allows excellent detail without affecting colour perception which means that traffic light colours are unaffected. The lens is available in single vision or progressive (varifocal) forms in brown, green and orange colours. The tint can be over the whole lens or graduated down to a paler tint paler to allow the dashboard to be seen normally. Remember it is against the law to drive during the day wearing lenses which transmit less than 8% of light (British Standard BS EN ISO 14889.2003). Driving at night is more demanding and stressful than driving in the daytime and results in four times as many accidents at night than during the day. The greater accident rate may partly be due to tiredness but the difficulty in seeing is a factor too. For night driving the regulations state that lenses should not transmit less than 75% of light (British Standard BS EN ISO 14889.2003). WHY DO I NOT SEE AS WELL AT NIGHT? If you find things look more blurred at night you should have your eyes examined. Lower levels of illumination cause the pupil in the centre of your eye (the black area) to become enlarged to allow more light in and this can result in a blur due to the optical aberrations of the eye. Spectacles may be necessary. Dirty or scratched windscreens and spectacles are the most common cause of haloes around lights. Having an anti-reflection coating on your spectacle lenses can help to minimise the effect of haloes and almost eliminates completely the problem of reflections from the spectacle lens and is highly recommended. Coloured haloes around lights can be indicative of extra fluid in the eye for which you should consult your optometrist urgently. Glare is commonly reported to be more noticeable with the increasing popularity of xenon or high intensity discharge (HID) headlamps which can be three times as bright as halogen lamps. Increased glare can mean the driver may be distracted or just not be able to see pedestrians and cyclists so easily. This problem can be worse on unlit roads and particularly for the elderly driver with partial cataracts (clouding of the lens in the eye) as light becomes more scattered in the eye. ARE AMBER NIGHT DRIVING SPECTACLES ADVISABLE? No. Sorry. These lenses appear to brighten things up because they are yellow but the tint actually cuts out light and, at night, you need more light, not less, so the problem may be made worse. Amber or yellow lenses may reduce veiling glare caused by short wavelengths in people with cataracts or crystalline lens clouding, however, it is illegal to drive at night with a significantly tinted lens. See the highway code for more details. Myopia is the medical name for shortsightedness and occurs when people see things clearly only when they are at short distances away and objects far away appear blurred. Night myopia is shortsightedness which occurs from being in an environment which is very dark, much darker than when driving on roads at night. Night myopia does not occur while driving with headlamps. Night blindness is the medical name applied to a condition when someone cannot see at night or in the dark due to disease of the eye. True night blindness is rare. If you do not have a serious eye problem medically diagnosed as affecting your side vision, such as glaucoma or retinitis pigmentosa or other peripheral retinal disease, you will not have night blindness. Patients with cataract may be able to read a number plate correctly in good light but not on a hazy day. A patient who has had one cataract removed is statistically more likely to crash a car than someone who has had two cataract operations. More than 3.8 million women drivers in the UK drive without their spectacles when they should be wearing them, according to a survey conducted by insurer Sheilas' Wheels. The main reason is that women are too embarrassed at not looking fashionable. Incredible as it may sound there is an easy answer, go to D & J Brower Opticians and get a fashionable pair of spectacles. Make sure car lights are clean, correctly working including properly aligned and always carry spare light bulbs and spectacles. According to the Driver and Vehicle Licensing Agency (DVLA), you must be able to read in good daylight, if necessary wearing glasses or contact lenses, a motor vehicle number plate with letters 79.4 mm (3.1 inches) high and from a distance of 20.5 metres (67 feet) or 20 metres (66 feet) for the September 2001 onwards style number plate. If someone is unable to meet this standard the driver must not drive and the license must be refused or revoked. Drivers of larger vehicles must meet a more stringent standard. Passing this test does not imply that your eyesight is perfect. The DVLA has set out proposals that will reduce the distance required to read a number plate from 20 metres to only 17.5 m to be in harmony with other European states, however the peripheral (side) vision may be taken into consideration also. In a survey 58% of people were unaware of the correct vision standard required or could quote it correctly and only 7% of drivers had actually ever checked their own vision. The same study revealed that 16% of drivers failed the number plate test but the DVLA is not convinced that defective vision is a significant cause of road traffic accidents. It is an offence to drive with uncorrected vision below the required standard. You misidentify the Licensing Authority if your vision does not meet the standard or if you have been specifically advised that it is likely to fall below it (Road Traffic Act 1991). The maximum penalty for driving with defective sight is £1000, three penalty points or a discretionary disqualification. The driving examiner carries out the above eyesight check before a candidate takes the practical driving test. It is natural for eyesight to change particularly over the age of 45, although even young drivers can have problems that have not been detected. 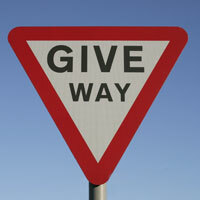 Research has indicated that 20% of drivers could have an eyesight problem. Driving licences are normally valid to the age of 70. The onus is on drivers to ensure that their vision meets the required standard at all times. It is advisable to have your eyes checked at the opticians at least every two years. If night driving becomes difficult you should get your eyes properly examined as this may highlight a problem. We able to give advice on which lenses are best for day or night time driving.